New open access article, Genome diversity in the Neolithic Globular Amphorae culture and the spread of Indo-European languages, by Tassi et al. (2017). 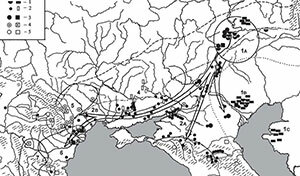 It is unclear whether Indo-European languages in Europe spread from the Pontic steppes in the late Neolithic, or from Anatolia in the Early Neolithic. Under the former hypothesis, people of the Globular Amphorae culture (GAC) would be descended from Eastern ancestors, likely representing the Yamnaya culture. 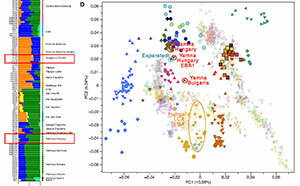 However, nuclear (six individuals typed for 597 573 SNPs) and mitochondrial (11 complete sequences) DNA from the GAC appear closer to those of earlier Neolithic groups than to the DNA of all other populations related to the Pontic steppe migration. 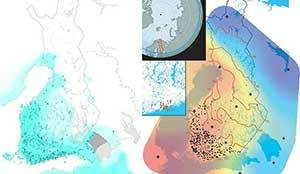 Explicit comparisons of alternative demographic models via approximate Bayesian computation confirmed this pattern. 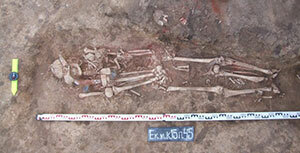 These results are not in contrast to Late Neolithic gene flow from the Pontic steppes into Central Europe. However, they add nuance to this model, showing that the eastern affinities of the GAC in the archaeological record reflect cultural influences from other groups from the East, rather than the movement of people. 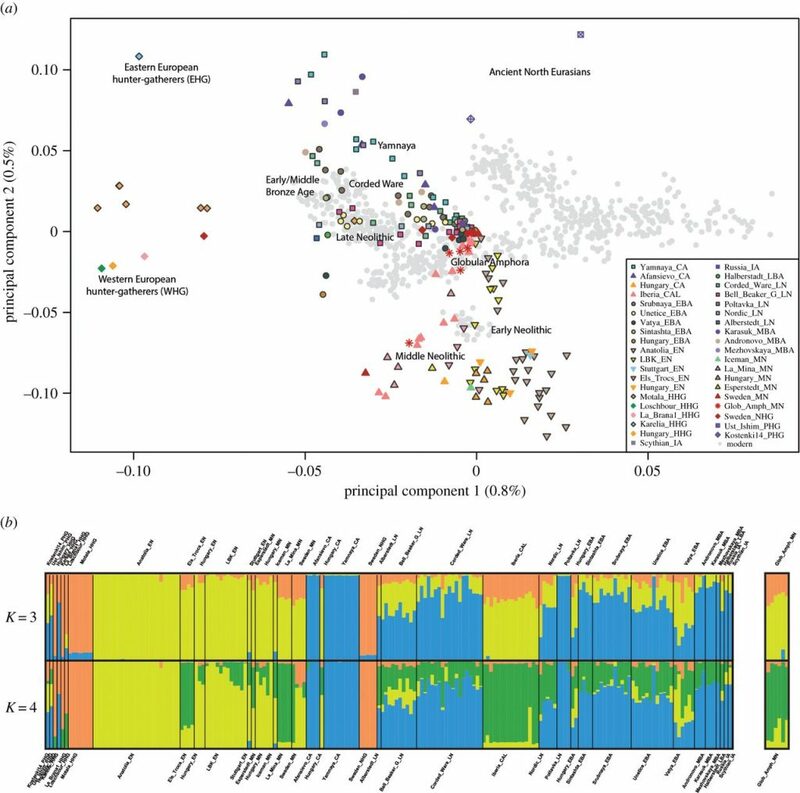 (a) Principal component analysis on genomic diversity in ancient and modern individuals. (b) K = 3,4 ADMIXTURE analysis based only on ancient variation. 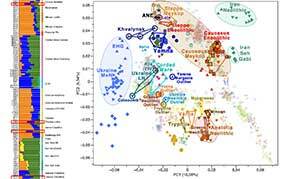 (a) Principal component analysis of 777 modern West Eurasian samples with 199 ancient samples. Only transversions considered in the PCA (to avoid confounding effects of post-mortem damage). We represented modern individuals as grey dots, and used coloured and labelled symbols to represent the ancient individuals. (b) Admixture plots at K = 3 and K = 4 of the analysis conducted only considering the ancient individuals. The full plot is shown in electronic supplementary material, figure S7. 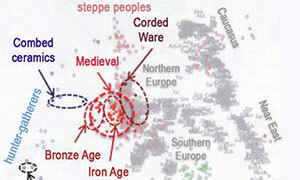 The ancient populations are sorted by a temporal scale from Pleistocene to Iron Age. The GAC samples of this study are displayed in the box on the right. In its classical formulation, the Kurgan hypothesis, i.e. a late Neolithic spread of proto-Indo-European languages from the Pontic steppes, regards the GAC people as largely descended from Late Neolithic ancestors from the East, most likely representing the Yamna culture; these populations then continued their Westward movement, giving rise to the later Corded Ware and Bell Beaker cultures. 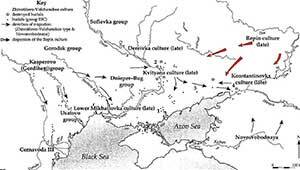 Gimbutas  suggested that the spread of Indo-European languages involved conflict, with eastern populations spreading their languages and customs to previously established European groups, which implies some degree of demographic change in the areas affected by the process. The genomic variation observed in GAC individuals from Kierzkowo, Poland, does not seem to agree with this view. Indeed, at the nuclear level, the GAC people show minor genetic affinities with the other populations related with the Kurgan Hypothesis, including the Yamna. On the contrary, they are similar to Early-Middle Neolithic populations, even geographically distant ones, from Iberia or Sweden. As already found for other Late Neolithic populations , in the GAC people’s genome there is a component related to those of much earlier hunting-gathering communities, probably a sign of admixture with them. At the nuclear level, there is a recognizable genealogical continuity from Yamna to Corded Ware. However, the view that the GAC people represented an intermediate phase in this large-scale migration finds no support in bi-dimensional representations of genome diversity (PCA and MDS), ADMIXTURE graphs, or in the set of estimated f3-statistics. Scheme summarizing the five alternative models compared via ABC random forest. We generated by coalescent simulation mtDNA sequences under five models, differing as to the number of migration events considered. 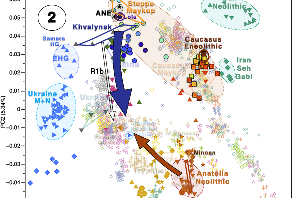 The coloured lines represent the ancient samples included in the analysis, namely Unetice (yellow line), Bell Beaker (purple line), Corded Ware (green line) and Globular Amphorae (red line) from Central Europe, Yamnaya (light blue line) and Srubnaya (brown line) from Eastern Europe. 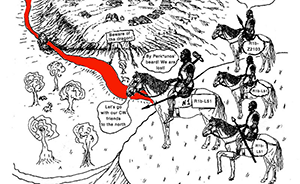 The arrows refer to the three waves of migration tested. 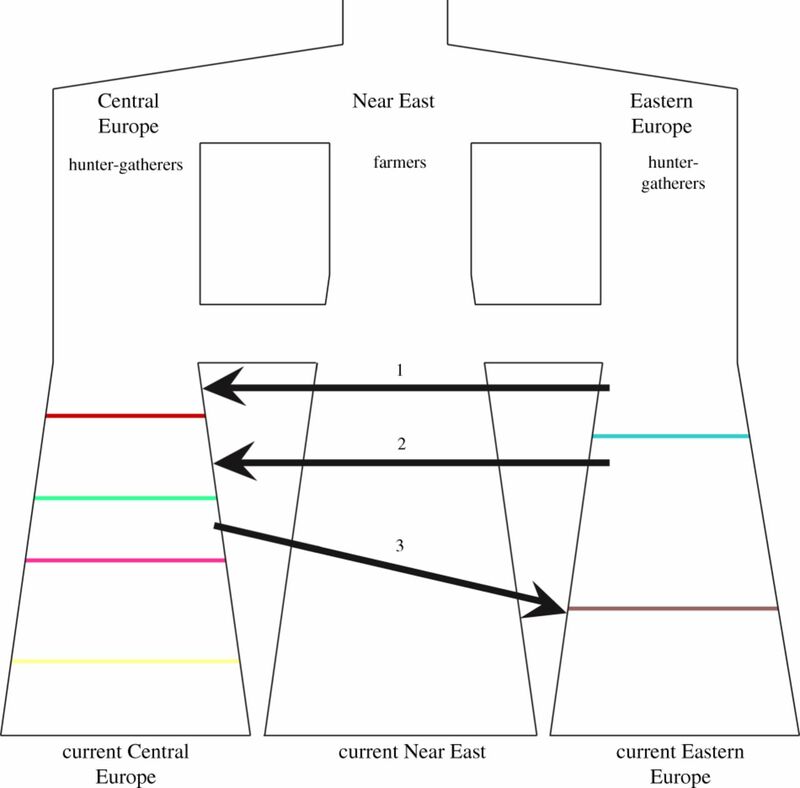 Model NOMIG was the simplest one, in which the six populations did not have any genetic exchanges; models MIG1, MIG2 and MIG1, 2 differed from NOMIG in that they included the migration events number 1, 2 (from Eastern to Central Europe, respectively before and after the onset of the GAC), or both. Model MIG2, 3 represents a modification of MIG2 model also including a back migration from Central to Eastern Europe after the development of the Corded Ware culture. Together with Globular Amphora culture samples from Mathieson et al. (2017), this suggests that Kristiansen’s Indo-European Corded Ware Theory is wrong, even in its latest revised models of 2017. On the other hand, the article’s genetic finds have some interesting connections in terms of mtDNA phylogeography, but without a proper archaeological model it is difficult to explain them. Haplogroup frequencies were obtained for Early Neolithic (EN), Middle Neolithic (MN), Chalcolithic (CA), and Late Neolithic (LN). 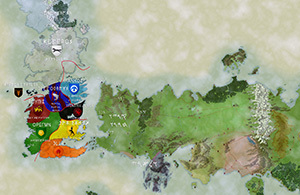 The color assigned to each haplogroup is represented on the lower right part of each plot. Haplogroup frequencies were plotted geographically using QGIS v2.14. 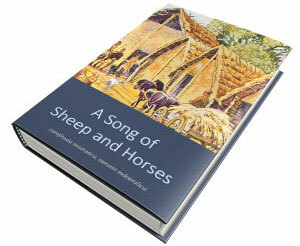 Text and images from the article under Creative Commons Attribution 4.0 license. Discovered first via Bernard Sécher’s blog.